MiniArt is back with another nice release for your diorama or vignette needs. This set provides three different German crew-served machine guns. This set provides two MG 34s, two MG 42s, and one ZB 53. 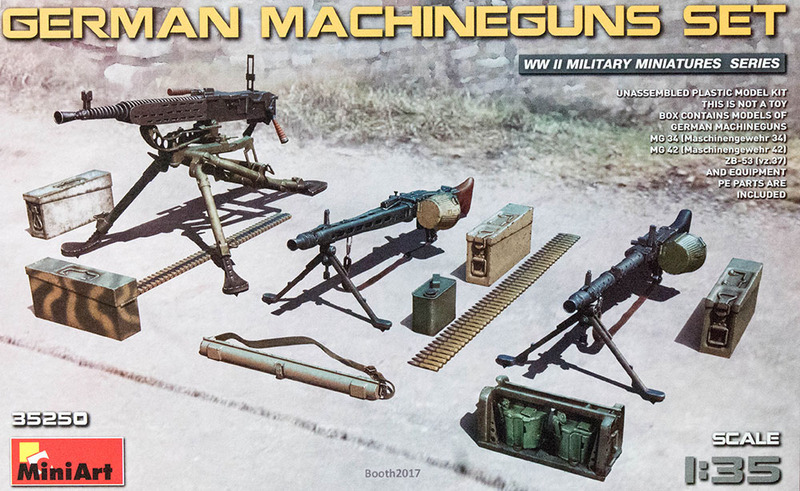 Each MG 34 features the weapon, choice of extended or stowed bipods, one photo-etched ammo belt, one ammo drum, one photo-etched sling, ammo can, and carrier with two ammo drums. Each MG 42 also features the weapon, choice of extended or stowed bipods, one photo-etched ammo belt, ammo can, and support gear. The Czech-made ZB-53 features the weapon with photo-etched heat shields and muzzle flash supressor, detailed tripod with two height options, photo-etched ammo belt, and two ammo cans. Each of these weapons is a detailed model in itself and will look great in a diorama or vignette of your design. Whether you need heavy firepower on the line or stowed in a vehicle, this set will provide some impressive visual details! Thanks to MiniArt Models for the review sample.